Health I.T. Sessions on its 3rd Stride is now H.I.T. 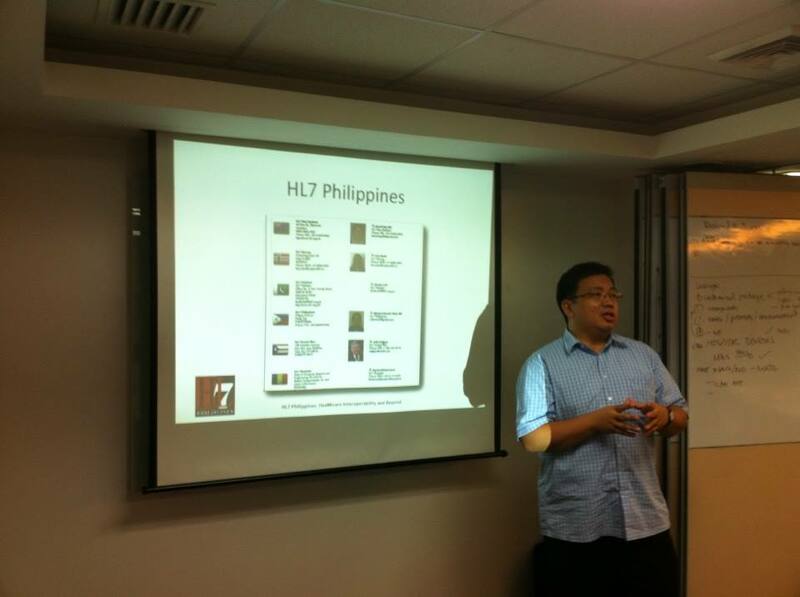 The third session of Health Level 7 Philippines’ Health I.T. Round Table Discussions was held last October 13, 2015. It is now officially called H.I.T. Sessions. Dr. Mike Muin of HL7 Philippines conducted updates on the progress of HL7 in integrating the various stakeholders with regards to the standards in transmitting and conveying information between healthcare providers, health industry Information Technology implementers, telco representatives, app developers, medical practitioners, professionals and stakeholders. The first subject for discussion was the presentation of Dr. Richard Mata who developed an app that creates digital medical prescriptions, patient records and even patient admissions to hospitals. The app available for laptop, iPhone and iPad use is called E-Prescription. It is intended for the use of Filipino doctors in the Philippine Medical setting. Dr. Mata disclosed that accidental mis-readings of handwritten medical prescriptions resulted in the death of around 7,000 Americans a year. That this is also occurring in the Philippines is also a fact. This is due to the notorious illegible handwriting of doctors and that mistakes in reading them are not uncommon. This is to the detriment of the patients and medical practitioners as well. It aims to do away with handwritten prescriptions as a means to minimize such mistakes in the practice of medicine. Because of his experience and the desire to streamline his practice, Dr. Mata decided that an app developed by a medical practitioner is the best and practical way of handling the needs particular to medical practitioners. Dr. Mata also realized that internet connectivity is a problem in most areas of the country particularly in rural areas where he practiced paediatrics. Thus the app was designed and develop to be a “stand-alone” app that will not require internet connectivity. This app was used by doctors who responded to a typhoon that recently devastated Compostela Valley. The app optimizes and speeds up the time that doctors spend for each patient. Not only is the prescription recorded and printed, patient records can also be archived digitally so that records can be retrieved via laptop, iPhone or iPad whenever it is required. What is also important is that all patient date in the app and the app itself will be “owned” by the doctor who uses it. Thus, video related requirements and the advent of new modalities will need DICOM Standard. This is a communication standard for handling, storing printing and transmitting medical information for medical imaging. It will provide for Interoperability of equipment and protects the system from future obsolescence. This will result in financial and workflow benefits and does away with hard files (paper). The H.I.T. Discussion is for the continued consolidation of the Health I.T. and I.T. industry and other stakeholders so as to create a comprehensive consensus with regards to standardization among the stakeholders.